The A19 weatherproof LED includes a diffusing lens that removes hot spots and offers an incandescent look. 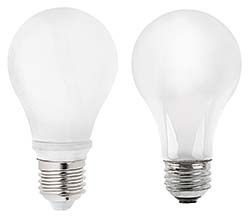 The bulb compares to a 35-40 watt (W) incandescent or halogen bulb while consuming 7.8 W of power at 350 lumens. With a weatherproof rating of IP65, the bulbs are designed for use in refrigerators, restrooms, and outdoor lamps.